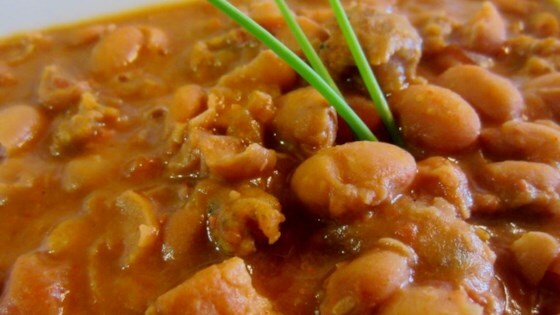 "Mexican 'pork and beans' recipe. If you like, top with lime, green onion, salsa, cheese, and sour cream, even pork rinds." Fry bacon strips in a large skillet over medium heat until crisp. With a slotted spoon, remove bacon to paper towels. Reserve 1/2 cup bacon drippings. Place drippings in a large pot, and warm over medium heat. Fry onions until light brown. Stir in ham and chorizo. Reserve 1 cup of beans, and add the rest to the pot, along with the chipotle and garlic. Mash the reserved beans, then add to the pot. Simmer beans until thick and soupy, about 30 minutes. (If the beans become too dry, stir in water). Remove chipotle and garlic, and serve. We didn't like this at all. When I cooked it, I had to add more ingredients to give it flavor. I added 2 cups of chicken broth to this because I was looking for more of a soup type meal and it turned out really well.